Our Jasper Tour was the second part of our Canadian Rockies adventure. We started off driving the famous Icefields Parkway from Lake Louise to Jasper. 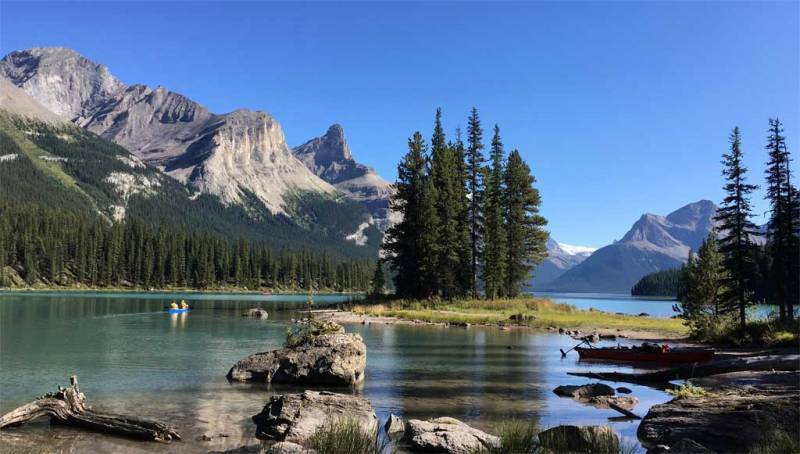 For our previous Banff Hiking Tour, click here. The Icefields Parkway drive was cold and slightly rainy. We skipped the mandatory tourist stop at Peyto Lake, because we had the luxury of having seen it on better days before. We arrived at the ice fields at Athabasca Glacier before noon and the view was covered in fog. At the information center, we learned that our planned hike to the Edith Cavell kettle pond had to be cancelled. The parking lot was under repair and all parking passes for the day were already allocated. The fog lifted from the glacier a few minutes later, but we decided against taking the highly popular tour by specialty vehicle on to the surface of the glacier. We headed up theIcefields Parkway to Sunwapta Falls next and did the one hour hike from the upper falls to the lower falls. Then we stopped at Athabasca Falls. I was surprised to see the waters of the Athabasca River were completely milky white. The last time I was here, the waters were a mix of white and beautiful glacial blue. By the time we reached Jasper, it was raining lightly. We drove just outside town to the Fairmont Jasper Park Lodge. We enjoyed checking it out and strolling along the grounds beside the emerald green waters of Lake Beauvert. The first day of our Jasper Tour day ended with an hour drive to the Super 8 in Hinton, Alberta. 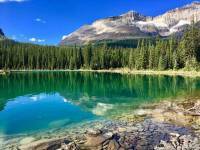 Hinton is located in the forested plains east of the Rockies and is extremely popular for its more reasonably priced hotels. 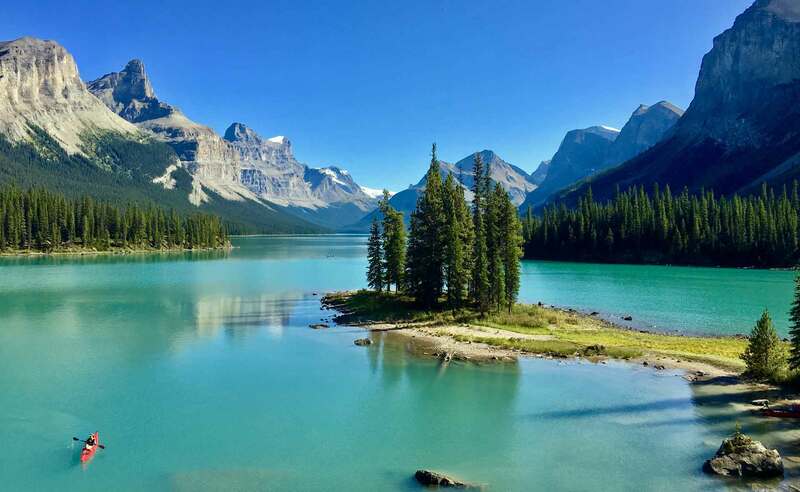 The next morning of our Jasper Tourwe were up at 5:45 am to make the two hour trip to Maligne Lake. We had reservations on the 35 minute boat ride to the most iconic photo location in the Canadian Rockies – Spirit Island. The weather in Hinton was sunny and clear with no forest fire smoke, which made me excited for good weather on the lake cruise. When we arrived at Maligne Lake, it was a different story. A thick blanket of fog covered the lake. The first 6 cruises were cancelled due to the fog, so we rebooked for the afternoon. You can rebook, but if you miss your scheduled departure time without contacting them first, you forfeit the full value of the ticket. We witnessed a large family arguing unsuccessfully for a refund for missing their cruise. So, don’t buy online advance tickets. The commitment you make is not worth the 10% savings on the ticket price. With our tickets rebooked, we drove one hour to Jasper and took the Jasper SkyTram. It was beautifully clear around Jasper. When you reach the top of theSkyTram gondola, you can see all the way to Mount Robson, the highest peak in the Canadian Rockies. It stood out as a distinctive triangle of ice, like a giant incisor protruding above all the other mountains around it. About 60% of the pine trees have turned completely dark red. It made for aa display that seemed to rival fall colors in the eastern USA and Canada. Unfortunately, these are all trees that are dying from mountain pine beetle. Jasper is anticipating they will lose 100% of their forest to the pine beetle. At the summit of the Jasper SkyTram, I enjoyed a meal of elk meatloaf. After the SkyTram, the next part of our Jasper Tour was a 15 minute drive to Maligne Canyon (French for “Wicked”) . We spent just over an hour at Maligne Canyon, walking down the steep, narrow canyon and crossing 4 of the 6 bridges that span it. Then we retraced the drive to Maligne Lake that we had done earlier in the morning. We passed Medicine Lake, which looks like the remnant of a drained reservoir. 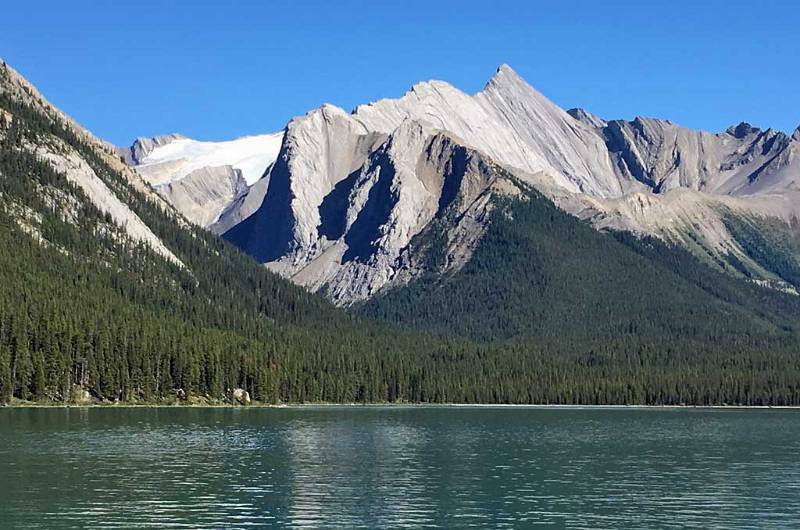 I learned from our boat tour later that Medicine Lake fills in spring with glacial runoff from Maligne Lake. The water then runs underground and comes out at Maligne Canyon. By the fall, Medicine Lake is empty and the small stream that meanders through its silty flat base is still supplying Maligne Canyon. We reached Maligne Lake by mid afternoon. 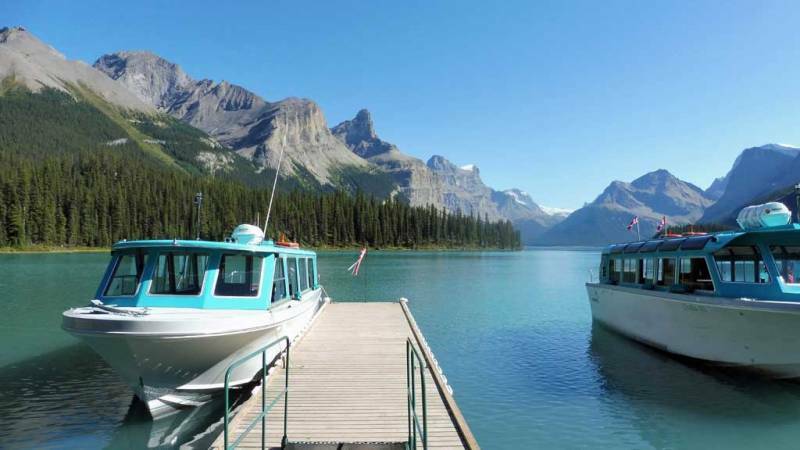 The Spirit Island stop on the Lake Maligne boat cruise was a highlight of our Rocky Mountain vacation. Spirit Island is at about the mid point of the lake. A box canyon tipped in snow and small glaciers frames the island. Spirit Island became famous when Peter Gales took a photo of it for Eastman Kodak. When the photo became part of the gigantic Kodak Colorama displays in New York in 1960, millions of people decided they wanted to see the real thing. The boat has a dock beside Spirit Island, where there’s a short pathway providing numerous photo opportunities. No one can walk on the small island. 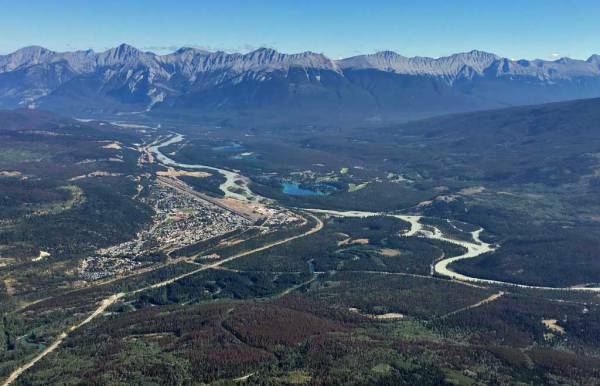 It’s a sacred place for the Stoney Nakoda First Nations people. The Stoney’s maintain a spiritual marker on this island, even though the land is now legally part of Jasper National Park. We finished up our Jasper Tour portion of our Canadian Rockies adventure with an early morning drive to Edmonton, where we returned the rental car and caught a flight home. We spent 6 full days in Jasper and Banff, but it took only two exceptional days to make the trip a perfect memory.